Commemorate that special someone's birthday with our ever-popular Happy Birthday Moonwalk! A bounce house adorned in a classic red, blue, and yellow color scheme, the Happy Birthday Moonwalk commemorates the special occasion with a colorful banner that depicts birthday imagery such as balloons, a birthday cake, and more. 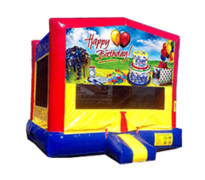 The bounce house features a large play area and mesh windows on every side of the unit, as well as a safety step for easy entrance/exit. Want to turn your next birthday celebration into something truly special? If so, look no further than our Happy Birthday Moonwalk, which is sure to thrill guests of all ages.